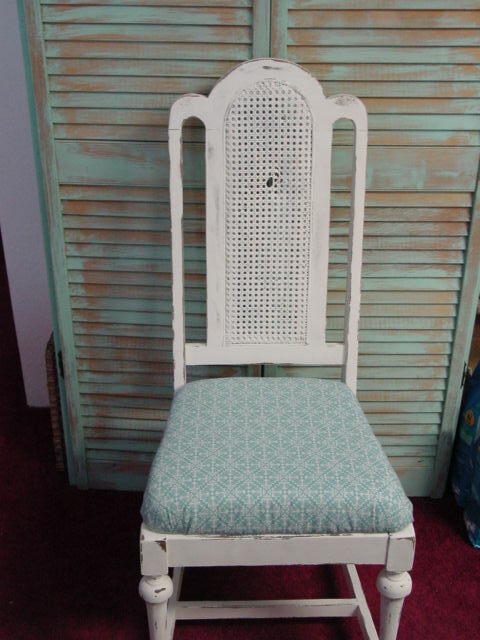 Old cane back chair ~shabby cottage chic make-over. Sigh. Once AGAIN, I got too excited when the sun came out and dashed outside and started painting . . .forgetting to take a before photo! Sorry! My bad. Originally this chair was dark DARK brown, with a brown leather covered seat, that had obviously sat upon for many, MANY years! First I removed the seat, saving it just long enough for Michael to use it as a template to cut me a new seat base. 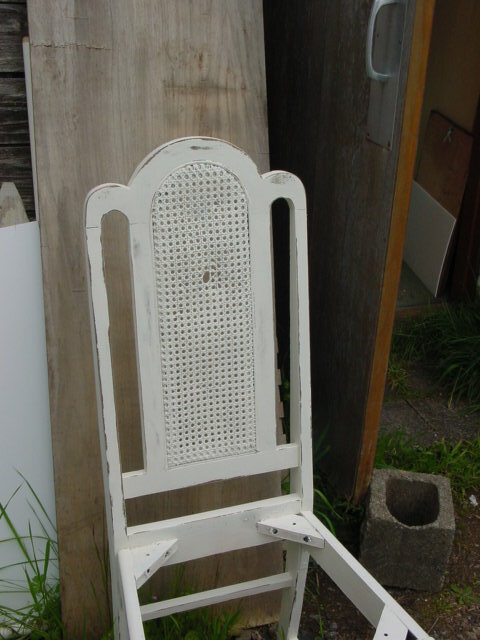 For some reason these VERY dark brown older chairs ‘bleed PINK’ when you add your first coat of paint. I used a good coat of KILZ primer, and just as I expected, it turned PINK (just on THIS chair, not on the other pieces I was working on!) Then it took a good THREE coats of white paint to get full coverage. The seat cushion base is smaller than the actual chair seat, as you can see. This is to allow room for your padding and fabric. Then I sanded the edges to distress it. Pondered if there was anything I could do to hide that little hole in the cane back. Michael suggested a slip cover for the back. While that WOULD work, the curves along the back are so pretty, it seemed a shame to cover them up; besides, I’m not good enough of a seamstress to perfectly fit a slip cover over those curves. MY slip covers tend to resemble pillow cases! So I just decided to leave it be. Afterall the chair IS supposed to look old and well-loved! Rummaged through my fabric pile to select the seat covering. This one had a pattern reminiscent of the cane pattern, so I selected it. About a hundred staples later . . .voila! 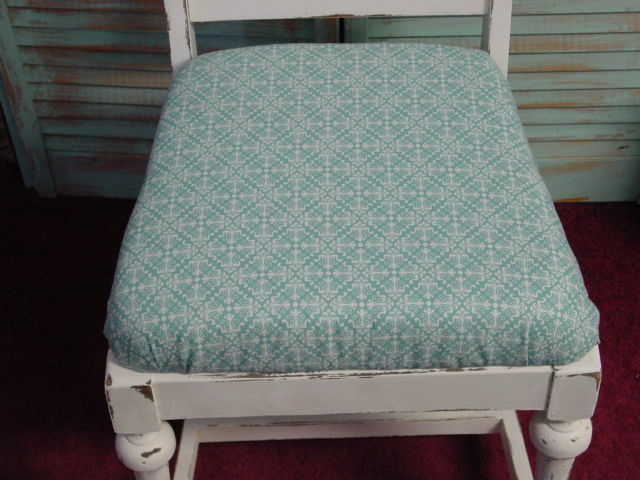 A 2″ foam pad atop the wood seat base; topped with quilt batting and then the fabric. Set some fo the fabric scraps aside to cover some pillows later on. A nice THICK and comfy seat! Now I keep looking at the darn HOLE in the back. It’s more noticeable in photos, because it doesn’t really bother me in person. And the paint will ‘hold it together’ so the hole won’t get any bigger. Whaddya think??? Does that hole bother YOU? 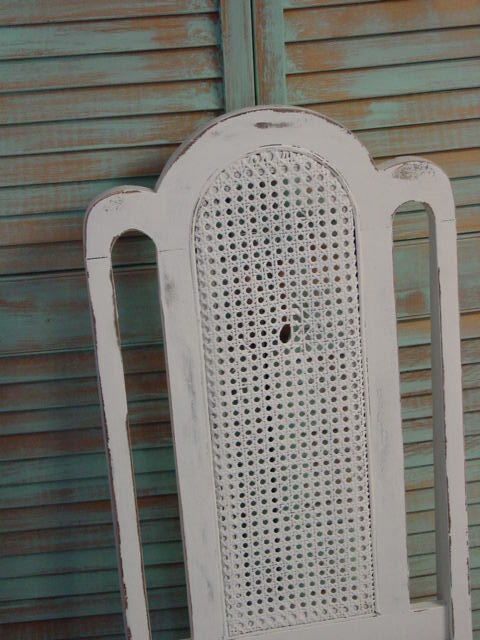 Would you buy an otherwise nice, shabby chic chair WITH a small hole in the back? 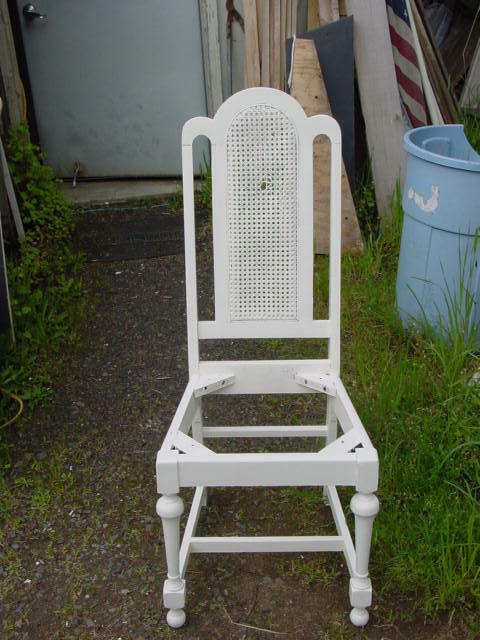 This chair is in storage right now; awaiting room for it in our space at Stars. Yes, the hole is too big and takes away from the beauty of the chair. Maybe weave ribbon or some sort of material from the bottom to the top to cover it. Another idea is to cover the entire wicker insert with the material of the chair seat. That though would cover the wicker which is not good. Usually I would agree that the hole is no big deal, but this hole is just too noticable. Hope this helps. The chair is beautiful after the redo. If it really bothers, find some vintage buttons and glue them randomly so it’s hidden. button,somthing quite flat so as not to poke you in the back. Love your chair I thought of buttons also or maybe a ruffle and a rosette? Love the chair! I’d maybe cover the hole with a fabric yo-yo that matches the seat or add a flat medallion or charm that’s big enough to cover it. Since it’s pretty centered an embellishment would look intentional. The chair looks great but the hole bothers me too. I think any of the ideas already mentioned would be great. I think something using a scrap of leftover fabric sounds really good. Weaving through with rosette or yo-yo. Possibly a little pillow tied to the back.?? I know whatever you choose..it will look great as always! Fabric cover a cardboard fleur de lis, very light padding, E6000 glue one to each side. You gotta think of the comfort of sitting against whatever you cover the hole with. 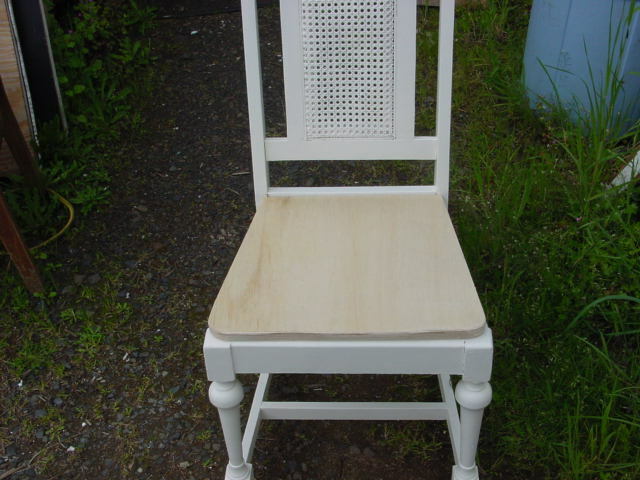 My mother re-caned chairs, the workmanship is too valuable to cover up! That chair is STILL sitting, untouched. I just can’t decide which idea to try. But, for SURE want to have it be comfortable. Nothing worse than sitting in a chair and feeling something poking you in the backThe fact that the hole is not ‘centered’ on the seat has me stumped too. worried it will look ‘off’ to have an embellishment not centered. Great job! love the color choice. 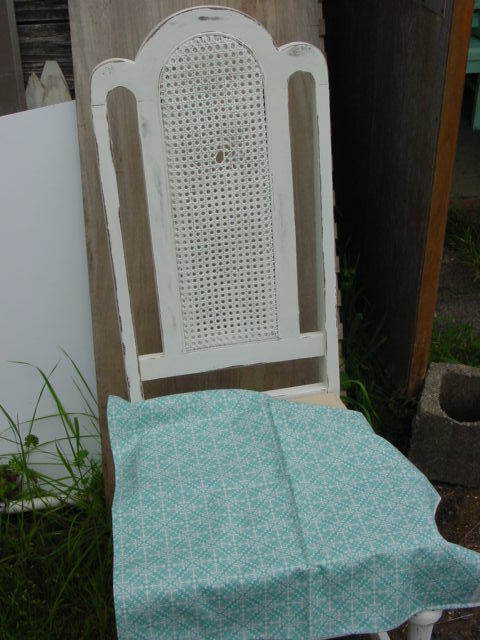 I think if you made a small – medium sized pad out of the same fabric, or similar, in either an arch, round or square shape ( i like the round or arch as it will match the lines if the chair, you can attach long thin ribbons to the top left and right of the pad and tie it on through the wicker leaving beautiful skinny bows on the back, also loosely weaving the same ribbon through the hole a couple of times, making ribbon wickerwork. Or a Simple but pretty one would be to Cut -Arrrggghhhh! !- Yes, cut the hole out a bit larger into a matching shape OR Cut away the wicker from 5 Holes in from either edge, going down for about 4 holes, making a slit, 4 holes long, repeat this on the other side, neaten the edges and run a wide long ribbon of mayby a darker green or contrasting colour in from the back, over the hole and back through the other slit tying up in a beautiful bow on the back. This would leave the back of the chair flat and comfortable!